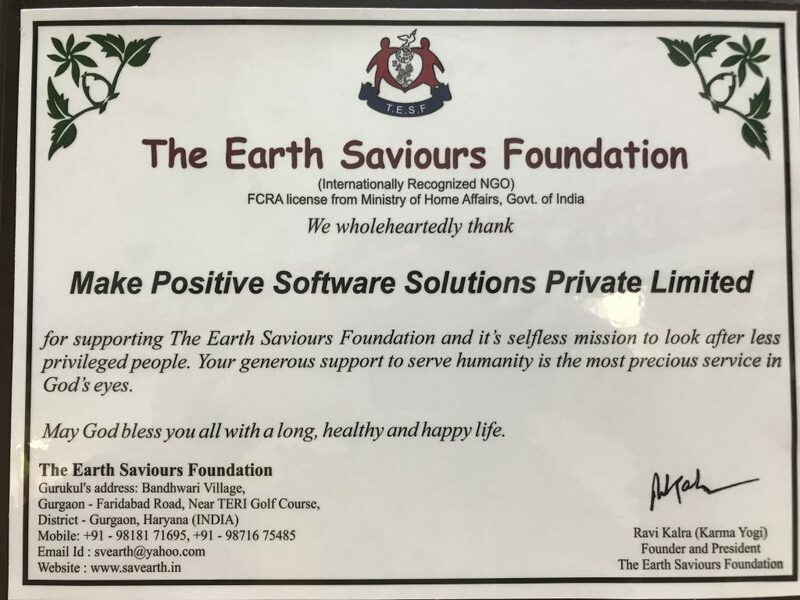 A few of us from the makepositive India office recently got a chance to visit the old age home at The Earth Saviours Foundation, Gurugram established in 2008 by Ravi Kalra (aka The Karma Yogi). We got a deep insight into some of the bitter and disillusioned realities of life, which turned out to be an eye-opener for us as we reflected on our way back to be always with our parents through thick and thin. I personally had some deep thought-provoking moments seeing them who have either been neglected or have just become unwanted by their children who now consider them more as a burden in the household. To our shock, we found that some of the elderly people there did not come willingly but were either just left at the door, or even worse, had been picked up from the roadside where they were abandoned by their families! I was very fortunate to meet the founder Mr. Ravi Kalra, who is indeed a superhuman with some extraordinary powers to not just acknowledge the needs of the elderly, but to take action and spend his life working towards their care. Mr. Kalra is a social activist and environmentalist with a dedicated Foundation to serve less privileged people while making every possible effort to protect the environment. The selfless, dedicated, committed, vigilant staff and volunteers of The Earth Saviours Foundation are working day and night for the community welfare under his leadership. As I entered one of the shelters, I saw an old man who was sitting all alone. One of the volunteers introduced me to his background telling me about how his family, for whom he did everything to establish a successful and luxurious life in his younger days, were now fighting to get the possession of his entire property while considering him to be the biggest hurdle of their lives and leaving him abandoned there. The old man couldn’t even speak and showed us his name tattooed on his arm. My colleagues and I were there with him for only about five minutes or so, and in spite of no verbal communication between us, he was there folding hands in respect to greet us. I could clearly see the moisture in his eyes as my own eyes moistened. There was an unusual warmth that soon spread around us which made me realize the importance of effortless love. While we always have love for our near and dear ones, it made me discover a strange love with these unknown people. A little later, I met a 73 years old gentlemen who had retired from the Army and had been living in the shelter for not a very long period, as he had chosen it as his home to help and support others around him to lead a peaceful life. He told us his story about how he was still in contact with his family but had made his own little world with the other physically and mentally challenged people at the shelter, trying to improve their standard of living as much as his health would allow him to. He made me believe so much more in humanity than I did before. Perhaps it’s rightly said that money can’t buy happiness - thankfully there are some things in our life which holds more importance than a piece of paper. The place was home to several mentally challenged people as well; few of them having sadly lost their balance to circumstances they were living under before coming there - forcefully or otherwise. I saw an old lady screaming, not accepting the food given by the staff. Somehow it reminded me of my childhood days when I was very choosy about food and how being simply careless, I just wanted to create a scene with my parents without understanding the importance of all the privileges I had back then. I could clearly see the struggle and patience each and every staff member had around such old men and women. Today, amidst our busy lives and while cursing bad moments, we forget to appreciate all the good things which we already have. IN THE END, IT’S NOT THE YEARS IN YOUR LIFE THAT COUNT. IT’S THE LIFE IN YOUR YEARS THAT MATTERS. By the end of the day, I did learn some lessons seeing the hard reality around me and how blessed I was to be healthy and alive. We must live our one and only life to the fullest making sure it’s a better place, not just for us, but for everyone around us. No comments on "My Visit to The Earth Saviours Foundation, Gurugram by Abhilasha Dhamija"